One day in 1981, in a tiny comic shop in London, I stumbled over an American magazine called Cinefex. Within its pages, I discovered a number of ultra-detailed articles about visual effects, a subject that had fascinated me for some time. The films under discussion were Dragonslayer and Raiders of the Lost Ark. The issue also contained a thought-provoking study of the brand new technologies behind some new-fangled process called computer imaging. Thirty-three years later, my fascination with visual effects hasn’t diminished. And my love affair with Cinefex is still going strong. That’s why the package that just came through my door is so special. 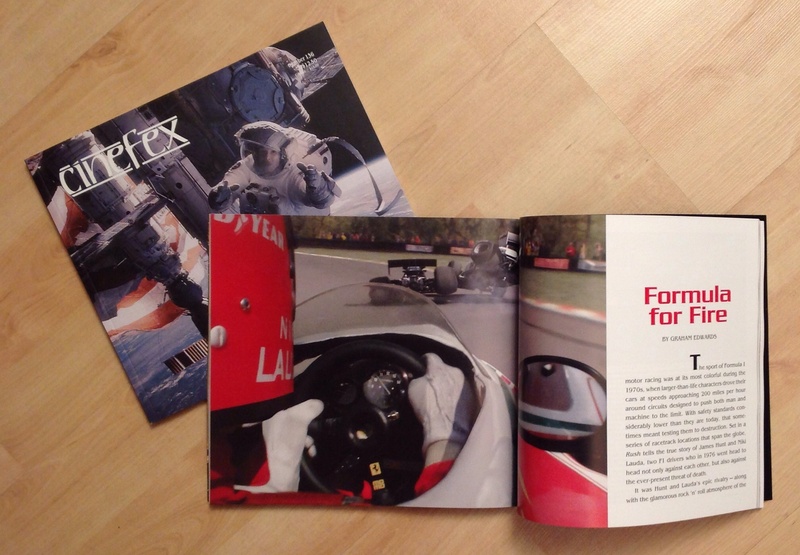 Inside were my author’s copies of Cinefex #136, which contains my debut article for the magazine – Formula For Fire, an in-depth analysis of the VFX of Ron Howard’s F1 film Rush. It’s my first serious piece of published non-fiction, and I’m very proud of it. Cinefex #136 – which also features definitive coverage of Gravity, Thor: The Dark World and Carrie – is available direct from the publishers’ website. Alternatively, try that little comic shop I mentioned – it’s called Forbidden Planet, and it’s now an international chain of stores. You can enjoy Cinefex either in traditional print form, through your web browser or as a stunning interactive iPad edition. The latter features a host of additional high-resolution pictures and exclusive video content. Congratulations for getting your article published Graham. I haven’t read it yet – I promised myself I’d read the article on ‘Gravity’ first – but I aim to get to it sharpish. Thanks, Gus. Don’t blame you for taking in “Gravity” first. Joe’s article is a stunner! I was so amazed by GRAVITY that I’m afraid to read how it was all done. As I get older I’m more inclined to avoid Cinefex in order to maintain the illusion and ‘magic’. Which is curious as back in my youth I read Cinefex and other similar mags fascinated by how things were done, loved watching the rare Horizon doc’s about films like 2010 (you remember that show?). These days I even find I’m avoiding the fx featurettes on Blu-ray discs. I mean, I know the basics, all the cgi stuff we see now, but all the same, I just find I need to avoid the details. Which is not to pour coldwater on your article by the way. Congratulations. These days I try to avoid reading up on films until I’ve seen them. In the old days, we often had to wait six months before the UK release of a big Hollywood movie, so it was hard to resist all the media coverage. Mind you, now we get at least six months of internet teases and spoilers, so it’s probably even harder to maintain a media blackout. Once I’ve seen the film, though, just try and stop me heading behind the scenes. For me, knowing how the magic was done just makes it all the more special. “Rush” was different, of course, because I got to learn about the visual effects straight from the horse’s mouth, before seeing the movie. Did that spoil the film? Not one bit. Mostly because, even though I knew what I was looking at, I still couldn’t believe what I was seeing. Now that’s a real magic trick.